The least complex form of the Multi-Story Ensemble Series employs the use of subplots. Subplots are tales or stories drawn with less resolution than the principal story. They hinge on one of the principal story’s characters other than the Main Character. This hinge character becomes the Main Character of the subplot story. Subplots are never essential to the progression of the principal plot and only serve to more fully explore issues tangential to the principal story’s argument. “Tangent” is a good word to use here, as it describes something that touches upon yet does not interfere with something else. Subplots may begin at any time during the course of the principal story, but should wrap up just before the principal climax, or just after in the denouement (author’s proof). Since subplots are essentially separate stories, they may or may not reflect the values and concerns of the principal story. This allows an author to complement or counterpoint the principal argument. 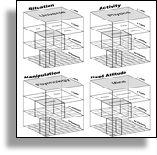 Frequently a subplot becomes a parallel of the principal story in another storytelling context, broadening the scope of the principal argument by inference to include all similar situations. In contrast, the subplot may arrive at the opposite conclusion, indicating that the solution for one storytelling situation is not universally appropriate. There can be as many subplots in a story as time allows. Each one, however, must hinge on a character who is essential to the principal story (as opposed to a character merely created for storytelling convenience). Each character can only head up a single subplot, just as the Main Character of the principal story cannot carry any additional subplots. However, the Main Character can (and often does) participate in a subplot as one of its objective characters. Other than subplots, Multi-Story Series can contain several stories that are not related at all. In this case, there may be two or more completely independent sets of characters who never cross paths. Or an author may choose to interweave these independent stories so that the characters come into contact, but only in an incidental way. In a sense, this form is sort of a “spatial anthology” wherein multiple stories are told not in succession but simultaneously. Perhaps the most complex form of the Multi-Story Ensemble Series is when both subplots and separate stories are employed. Often, the subplots and the separate stories both use the principal story’s characters as well as characters that do not come into play in the principal story. An over-abundance of storytelling becomes difficult to conclude within the limits of even a one-hour show. Therefore, single episodes can be treated more like acts with stories sometimes running over four or more episodes. Each episode might also contain subplots staggered in such a way that more than one may conclude or begin in the middle of another subplot which continues over several episodes. Obviously, a lot of cross-dynamics can be going on here. It is the author’s job as storyteller to make sure the audience is aware at all times as to which story or subplot they are seeing and what the character’s roles are in each context. This is essential, since no internal storyform is controlling all of the independent stories. They are held together here only by the connective tissue of storytelling. Characters represent dramatic functions which need to interact to reflect all sides of solving the story problem. The first interaction sets the relationship between the two characters. The second interaction brings them into conflict. The third interaction demonstrates which one fare better, establishing one as more appropriate than the other. 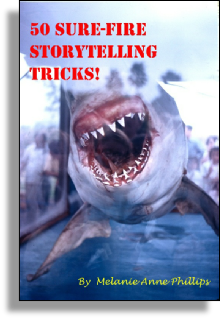 I hope you have enjoyed these storytelling tricks. If so, please stop by my web site at Storymind.com for many more. And while you are there, try free demos of our software products for writers to help you develop your story’s world, who’s in it, what happens to them, and what it all means.